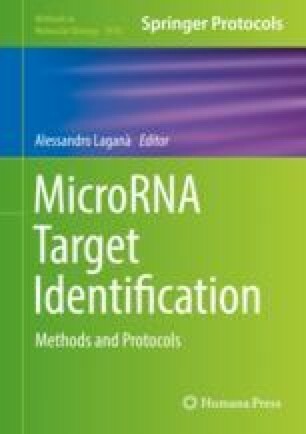 MicroRNAs (miRNAs) are fine-tuners of gene expression and contribute to the regulation of most, if not all, biological processes in eukaryotes by targeting both coding and noncoding RNAs. Typically, miRNAs repress numerous target transcripts and most target RNAs harbor binding sites for multiple miRNA families. It was recently proposed that transcripts sequester miRNAs and thereby regulate the abundance of other transcripts with which they have miRNA binding sites in common. Since competition for shared miRNAs is the mechanistic basis for this cross-regulation, such transcripts were termed competitive endogenous RNAs (ceRNAs). In this chapter, I discuss considerations for the computational prediction of ceRNAs based on miRNA binding site overlap. Moreover, I provide a framework for the experimental validation of miRNA-dependent reciprocal regulation of putative ceRNAs. I thank the members of my laboratory for critical reading of the manuscript. This work was partially supported by a K22 Career Development Award (1K22CA197058-01) and a project grant (1R03CA227349-01) from the NCI/NIH, and a Young Investigator Award from the Melanoma Research Alliance.